This itinerary will fit your unique luxury needs, designed for those wants to spend their weekends or holiday in breathtaking natural scenery and quite mini adventure on horseback. Without driving on rough of-road for many hours, you will fly only 20 minutes from Ulaanbaatar airport which is shorter than break time. In the morning pick you up from selected point and transport to Chinggis Khaan Airport. After a few minutes of check in process the airport announcement will finally call you to board on a plane destined to Princess Lodge. After 20 minutes of panoramic view of flight you will safely land on Khan Khentii grass landing strip. Thanks to Blue Sky aviation’s great experienced pilot Mr. Ryan. When you find your first step on the beautiful grass land, the local horse guide welcomes you. Ride a horse to Princess Lodge through stunning landscape Lodge for an hour. 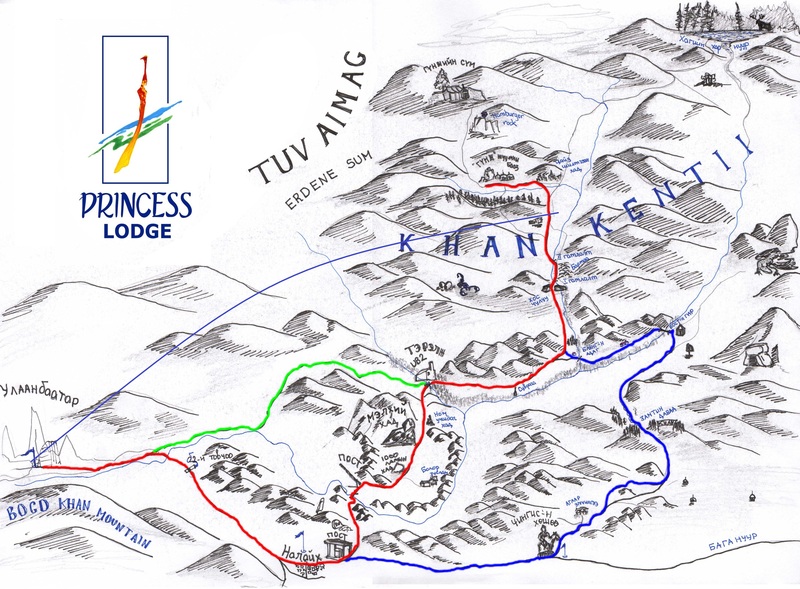 Have a Lunch at Princess Lodge and spend the day at tourist camp, hiking, Mongolian traditional game and mini concert. In the evening wooden sauna is optional. In the early morning after the tasty and nice breakfast at Princess Lodge, we ride horse or ox-cart to Khan Khentii grass landing strip. There Cessna caravan will be waiting you to take off right away. Upon arrival driver will pick you up and transfer to selected hotel or point. Transport:Our partner Blue Sky Aviation is flying to Princess Lodge with Grand Caravan 9 passenger seat. Our vehicles are prepared to travel on Mongolian road. We use variety of air-conditioned, four wheel drive vehicles and bus. The average mileage you will drive per day in Mongolian tour is 180 to 220 kilometers. Our vehicles include Land cruiser, Delica 2, Russian Van, Bus.